The war started with the British overconfident and under-prepared. The Boers were well armed and struck first, besieging Ladysmith, Kimberley, and Mahikeng in early 1900, and winning important battles at Colenso, Magersfontein and Stormberg. Staggered, the British brought in large numbers of soldiers and fought back. General Redvers Buller was replaced by Lord Roberts and Lord Kitchener. They relieved the three besieged cities, and invaded the two Boer republics in late 1900. The onward marches of the British Army, well over 400,000 men, were so overwhelming that the Boers did not fight staged battles in defense of their homeland. Ladysmith is a city in the Uthukela District of KwaZulu-Natal, South Africa. It lies 230 kilometres (140 mi) north-west of Durban and 365 kilometres (227 mi) south of Johannesburg. Important industries in the area include food processing, textiles, and tyre production. Motor vehicle tyres are produced by "Sumitomo Rubber South Africa" in the nearby town of Steadville. Kimberley is the capital and largest city of the Northern Cape Province of South Africa. It is located approximately 110 km east of the confluence of the Vaal and Orange Rivers. The city has considerable historical significance due to its diamond mining past and the siege during the Second Boer War. 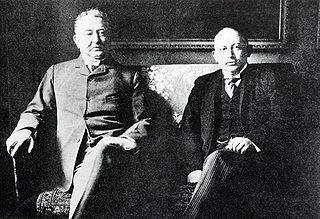 British businessmen Cecil Rhodes and Barney Barnato made their fortunes in Kimberley, and Rhodes established the De Beers diamond company in the early days of the mining town. Mahikeng, formerly, and still commonly known as Mafikeng and historically Mafeking in English, is the capital city of the North-West Province of South Africa. It was the site of the Siege of Mafeking during the Second Boer War. The British seized control of all of the Orange Free State and Transvaal, as the civilian leadership went into hiding or exile. In conventional terms, the war was over. 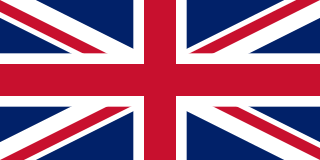 The British officially annexed the two countries in 1900. Back home, Britain's Conservative government wanted to capitalize on this success and use it to maneuver an early general election, dubbed a "khaki election" to give the government another six years of power in London. 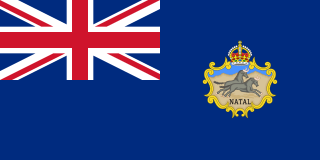 British military efforts were aided by Cape Colony, the Colony of Natal and some native African allies, and further supported by volunteers from the British Empire, including Southern Africa, the Australian colonies, Canada, India and New Zealand. All other nations were neutral, but public opinion was largely hostile to the British. [ citation needed ] Inside the UK and its Empire there also was significant opposition to the Second Boer War. In Westminster systems of government, a khaki election is any national election which is heavily influenced by wartime or postwar sentiment. In the British general election of 1900, the Conservative Party government of Lord Salisbury was returned to office, defeating a disunited Liberal Party. The reason for this name is that the election was held in the midst of the Second Boer War and khaki was the colour of the relatively new military uniform of the British Army that had been universally adopted in that war. 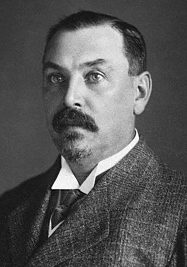 Louis Botha was a South African politician who was the first Prime Minister of the Union of South Africa—the forerunner of the modern South African state. A Boer war hero during the Second Boer War, he would eventually fight to have South Africa become a British Dominion. 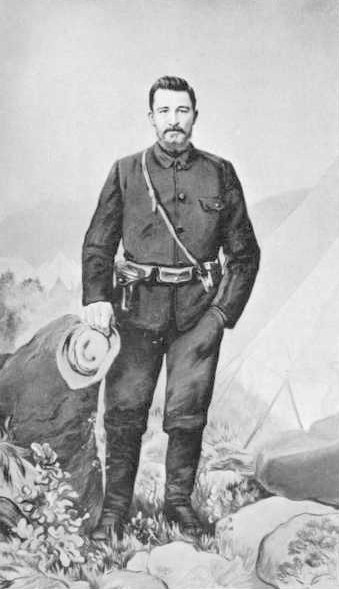 Christiaan Rudolf de Wet was a Boer general, rebel leader and politician. The UK's response to guerilla warfare was to set up complex nets of block houses, strong points, and barbed wire fences, partitioning off the entire conquered territory. 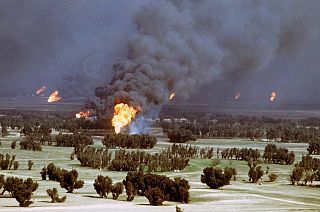 In addition, civilian farms and live stock were destroyed in the scorched earth strategy. Survivors were forced into concentration camps. Very large proportions of these civilians died of hunger and disease, especially the children  . 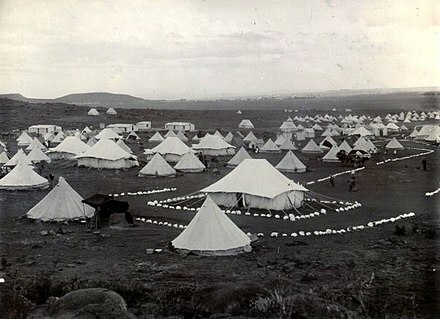 British concentration camps refers to internment camps operated by the British in South Africa during the Second Anglo-Boer War from 1900–1902. The term "concentration camp" grew in prominence during this period. The Treaty of Vereeniging was a peace treaty, signed on 31 May 1902, that ended the Second Boer War between the South African Republic and the Orange Free State, on the one side, and the United Kingdom on the other. Some parts of the British press and British government expected the campaign to be over within months, and the protracted war gradually became less popular, especially after revelations about the conditions in the concentration camps (where as many as 26,000 Afrikaner women and children died of disease and malnutrition). The Boer forces finally surrendered on Saturday, 31 May 1902, with 54 of the 60 delegates from the Transvaal and Orange Free State voting to accept the terms of the peace treaty. This was known as the Treaty of Vereeniging, and under its provisions, the two republics were absorbed into the British Empire, with the promise of self-government in the future. This promise was fulfilled with the creation of the Union of South Africa in 1910. The war had a lasting effect on the region and on British domestic politics. 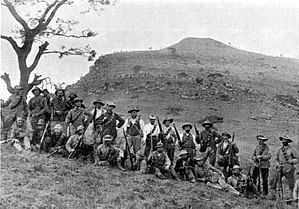 For Britain, the Second Boer War was the longest, the most expensive (£211 million, £202 billion at 2014 prices), and the bloodiest conflict between 1815 and 1914,  lasting three months longer and resulting in more British combat casualties than the Crimean War (1853–56), although more soldiers died from disease in the Crimean War. The uitlanders resented the taxes levied by the Transvaal government, particularly when this money was not spent on Johannesburg or uitlander interests, but diverted to projects elsewhere in the Transvaal. For example, as the gold-bearing ore sloped away from the outcrop underground to the south, more and more blasting was necessary for extraction, and mines consumed vast quantities of explosives. A box of dynamite costing five pounds included five shillings tax. Not only was this tax perceived as exorbitant, but British interests were offended when President Paul Kruger gave monopoly rights for the manufacture of the explosive to a non-British branch of the Nobel company, which infuriated Britain. The so-called "dynamite monopoly" became a casus belli. British imperial interests were alarmed when in 1894–95 Kruger proposed building a railway through Portuguese East Africa to Delagoa Bay, bypassing British-controlled ports in Natal and Cape Town and avoiding British tariffs. At the time the Prime Minister of the Cape Colony was Cecil Rhodes, a man driven by a vision of a British-controlled Africa extending from Cape to Cairo. 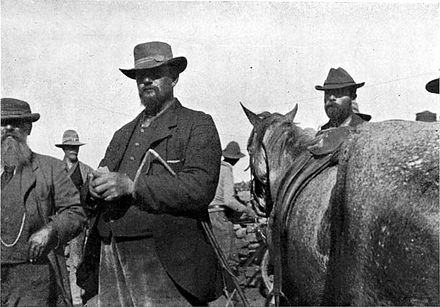 Certain self-appointed uitlanders representatives and British mine owners became increasingly angered and frustrated by their dealings with the Transvaal government. 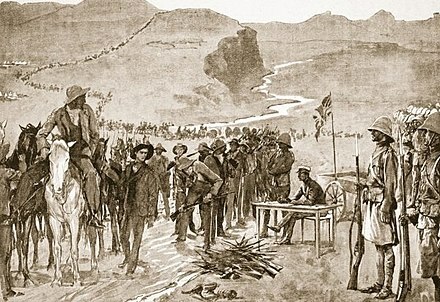 A Reform Committee (Transvaal) was formed to represent the uitlanders. 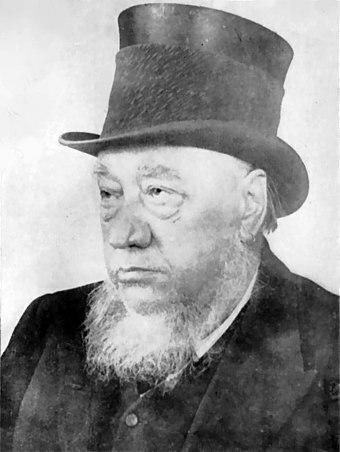 President Paul Kruger re-equipped the Transvaal army, importing 37,000 of the latest Mauser Model 1895 rifles, and some 40 to 50 million rounds of ammunition. The best modern European artillery was also purchased. By October 1899 the Transvaal State Artillery had 73 heavy guns, including four 155 mm Creusot fortress guns and 25 37 mm Maxim Nordenfeldt guns. 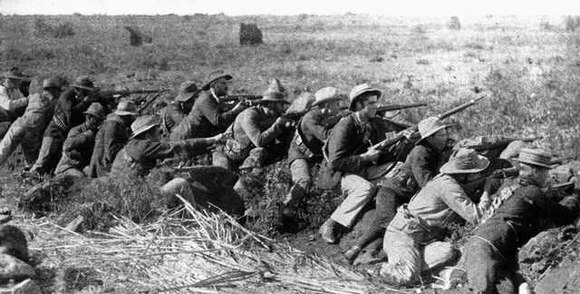 The Transvaal army had been transformed; approximately 25,000 men equipped with modern rifles and artillery could mobilise within two weeks. President Kruger's victory in the Jameson Raid incident did nothing to resolve the fundamental problem of finding a formula to conciliate the uitlanders, without surrendering the independence of the Transvaal. The failure to gain improved rights for uitlanders became a pretext for war and a justification for a big military buildup in Cape Colony. The case for war was developed and espoused as far away as the Australian colonies. [ full citation needed ] The Cape Colony Governor, Sir Alfred Milner, Cape Prime Minister Cecil Rhodes, the Colonial Secretary Joseph Chamberlain, and mining syndicate owners (Randlords, nicknamed the gold bugs), such as Alfred Beit, Barney Barnato, and Lionel Phillips favoured annexation of the Boer republics. Confident that the Boers would be quickly defeated, they planned and organised a short war, citing the uitlanders' grievances as the motivation for the conflict. 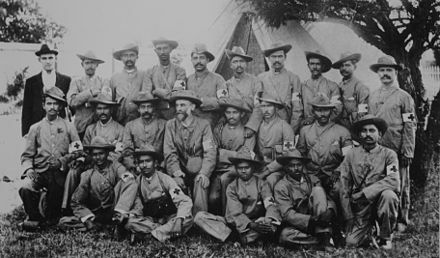 When war with the Boer Republics was imminent in September 1899, a Field Force, referred to as the Army Corps (sometimes 1st Army Corps) was mobilised and sent to Cape Town. It was "about the equivalent of the I Army Corps of the existing mobilization scheme" and was placed under the command of Gen Sir Redvers Buller, GOC in C of Aldershot Command. In South Africa the corps never operated as such and the 1st, 2nd and 3rd divisions were widely dispersed. War was declared on 11 October 1899 with a Boer offensive into the British-held Natal and Cape Colony areas. The Boers had about 33,000 soldiers, and decisively outnumbered the British, who could move only 13,000 troops to the front line. The Boers had no problems with mobilisation, since the fiercely independent Boers had no regular army units, apart from the Staatsartillerie (Afrikaans for 'States Artillery') of both republics. As with the First Boer War, since most of the Boers were members of civilian militias, none had adopted uniforms or insignia. Only the members of the Staatsartillerie wore light green uniforms. By taking command in person in Natal, Buller had allowed the overall direction of the war to drift. Because of concerns about his performance and negative reports from the field, he was replaced as Commander in Chief by Field Marshal Lord Roberts. 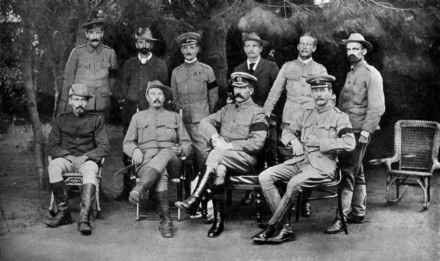 Roberts quickly assembled an entirely new team for headquarters staff and he chose military men from far and wide: Lord Kitchener (Chief of Staff) from the Sudan; Frederick Russell Burnham (Chief of Scouts), the American scout, from the Klondike; David Henderson from the Staff College; Neville Bowles Chamberlain from Afghanistan; and William Nicholson (Military Secretary) from Calcutta  Like Buller, Roberts first intended to attack directly along the Cape Town – Pretoria railway but, again like Buller, was forced to relieve the beleaguered garrisons. Leaving Buller in command in Natal, Roberts massed his main force near the Orange River and along the Western Railway behind Methuen's force at the Modder River, and prepared to make a wide outflanking move to relieve Kimberley. After being forced to delay for several weeks at Bloemfontein by a shortage of supplies, an outbreak of enteric (typhoid) fever caused by poor hygiene, drinking bad drinking water at Paardeburg, and appalling medical care, Roberts finally resumed his advance. He was forced to halt again at Kroonstad for 10 days, due once again to the collapse of his medical and supply systems, but finally captured Johannesburg on 31 May and the capital of the Transvaal, Pretoria, on 5 June. The first into Pretoria was Lt. William Watson of the New South Wales Mounted Rifles, who persuaded the Boers to surrender the capital. [ full citation needed ] Before the war, the Boers had constructed several forts south of Pretoria, but the artillery had been removed from the forts for use in the field, and in the event they abandoned Pretoria without a fight. 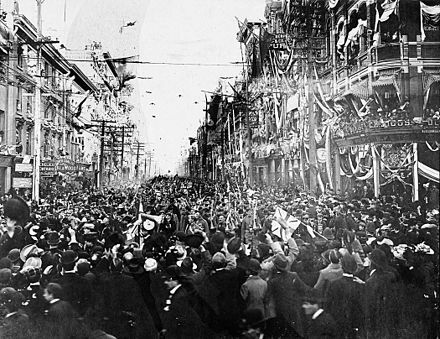 Having won the principal cities, Roberts declared the war over on 3 September 1900; and the South African Republic was formally annexed. From the Basin, Christiaan De Wet headed west. Although hounded by British columns, he succeeded in crossing the Vaal into western Transvaal, to allow Steyn to travel to meet their leaders. There was much sympathy for the Boers on mainland Europe. 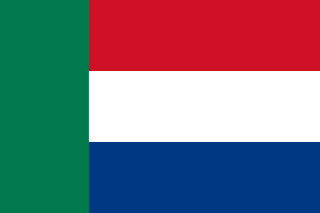 In October, President Kruger and members of the Transvaal government left Portuguese East Africa on the Dutch warship De Gelderland , sent by the Queen Wilhelmina of the Netherlands. Paul Kruger's wife, however, was too ill to travel and remained in South Africa where she died on 20 July 1901 without seeing her husband again. President Kruger first went to Marseille and then on to the Netherlands, where he stayed for a while before moving finally to Clarens, Switzerland, where he died in exile on 14 July 1904. 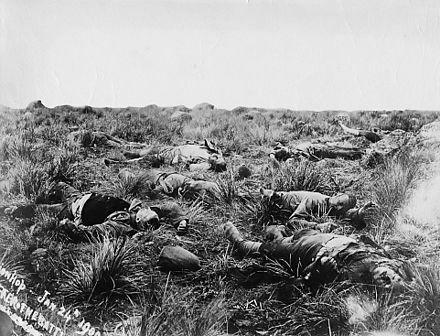 The first sizeable batch of Boer prisoners of war taken by the British consisted of those captured at the Battle of Elandslaagte on 21 October 1899. At first, many were put on ships, but as numbers grew, the British decided they did not want them kept locally. 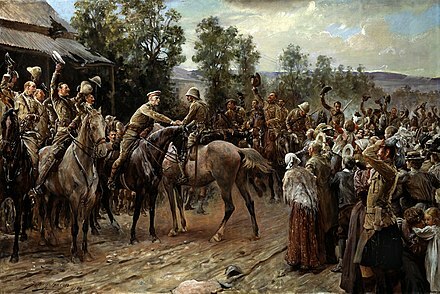 The capture of 400 POWs in February 1900 was a key event, which made the British realise they could not accommodate all POWs in South Africa. The British feared they could be freed by sympathetic locals. Moreover, they already had trouble supplying their own troops in South Africa, and did not want the added burden of sending supplies for the POWs. Britain therefore chose to send many POWs overseas. The blockhouse system required an enormous number of troops to garrison. 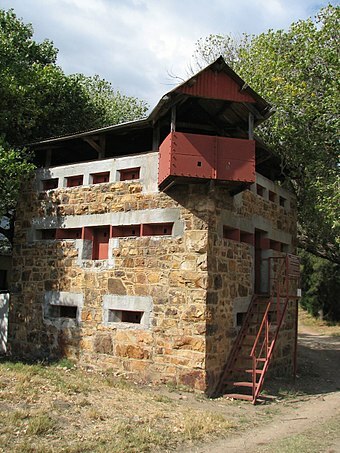 Well over 50,000 British troops, or 50 battalions, were involved in blockhouse duty, greater than the approximately 30,000 Boers in the field during the guerrilla phase. In addition, up to 16,000 Africans were used both as armed guards and to patrol the line at night. The Army linked the blockhouses with barbed wire fences to parcel up the wide veld into smaller areas. "New Model" drives were mounted under which a continuous line of troops could sweep an area of veld bounded by blockhouse lines, unlike the earlier inefficient scouring of the countryside by scattered columns. 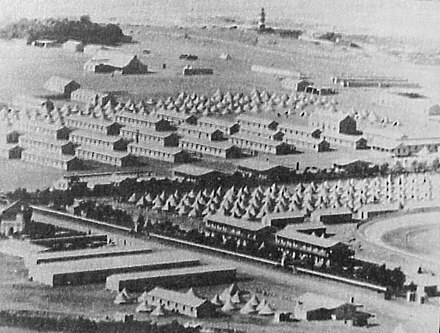 The camps were poorly administered from the outset and became increasingly overcrowded when Kitchener's troops implemented the internment strategy on a vast scale. Conditions were terrible for the health of the internees, mainly due to neglect, poor hygiene and bad sanitation. The supply of all items was unreliable, partly because of the constant disruption of communication lines by the Boers. The food rations were meager and there was a two-tier allocation policy, whereby families of men who were still fighting were routinely given smaller rations than others  The inadequate shelter, poor diet, bad hygiene and overcrowding led to malnutrition and endemic contagious diseases such as measles, typhoid and dysentery to which the children were particularly vulnerable. Coupled with a shortage of modern medical facilities, many of the internees died. Emily Hobhouse was instrumental in bringing relief to the concentration camps, as well as raising public awareness in Europe of the atrocities. The British offered terms of peace on various occasions, notably in March 1901, but were rejected by Botha and the "Bitter-enders" among the commandos. They pledged to fight until the bitter end and rejected the demand for compromise made by the "Hands-uppers." Their reasons included hatred of the British, loyalty to their dead comrades, solidarity with fellow commandos, an intense desire for independence, religious arguments, and fear of captivity or punishment. On the other hand, their women and children were dying every day and independence seemed impossible. 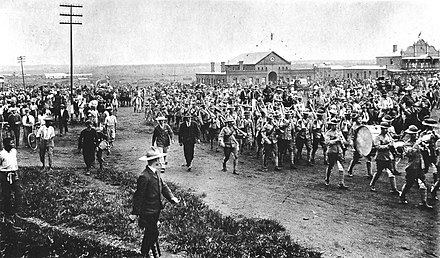 The last of the Boers surrendered in May 1902 and the war ended with the Treaty of Vereeniging signed on 31 May 1902. The British had won and offered generous terms to regain the support of the Boers.The Boers were given £3,000,000 for reconstruction and were promised eventual limited self-government, which was granted in 1906 and 1907. The treaty ended the existence of the South African Republic and the Orange Free State as independent Boer republics and placed them within the British Empire. The Union of South Africa was established as a dominion of the British Empire in 1910. Many Irish nationalists sympathised with the Boers, viewing them to be a people oppressed by British imperialism, much like themselves. Irish miners already in the Transvaal at the start of the war formed the nucleus of two Irish commandos. The Second Irish Brigade was headed up by an Australian of Irish parents, Colonel Arthur Lynch. In addition, small groups of Irish volunteers went to South Africa to fight with the Boers – this despite the fact that there were many Irish troops fighting in the British army, including the Royal Dublin Fusiliers. [lower-alpha 5] In Britain, the "Pro-Boer" campaign expanded, [lower-alpha 6] with writers often idealising the Boer society. From 1899 to 1901 the six separate self-governing colonies in Australia sent their own contingents to serve in the Boer War. That much of the population of the colonies had originated from Great Britain explains a desire to support Britain during the conflict appealing to many. After the colonies formed the Commonwealth of Australia in 1901, the new Government of Australia sent "Commonwealth" contingents to the war. The Boer War was thus the first war in which the Commonwealth of Australia fought. 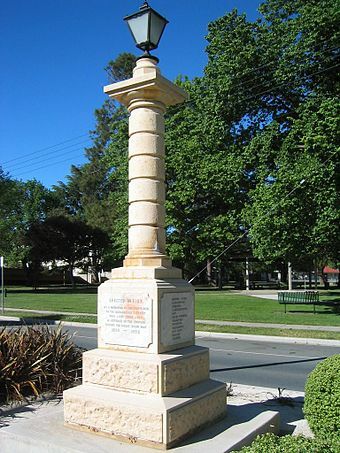 A few Australians fought on the Boer side. The most famous and colourful character was Colonel Arthur Alfred Lynch, formerly of Ballarat, Victoria, who raised the Second Irish Brigade. Like the Canadian and particularly the Australian and New Zealand contingents, many of the volunteer units formed by South Africans were "light horse" or mounted infantry, well suited to the countryside and manner of warfare. Some regular British officers scorned their comparative lack of formal discipline, but the light horse units were hardier and more suited to the demands of campaigning than the overloaded British cavalry, who were still obsessed with the charge by lance or sabre. [lower-alpha 7] At their peak, 24,000 South Africans (including volunteers from the Empire) served in the field in various "colonial" units. 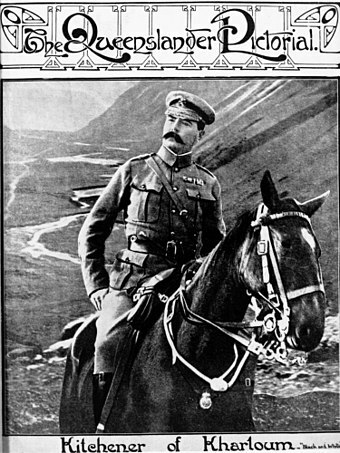 Notable units (in addition to the Imperial Light Horse) were the South African Light Horse, Rimington's Guides, Kitchener's Horse and the Imperial Light Infantry. Lieutenant Richard Ernest William Turner – Soldier of the Royal Canadian Dragoons, Turner received his Victoria Cross during the same portion of the conflict as Cockburn. Turner was wounded in the conflict, however unlike Cockburn, Turner escaped. 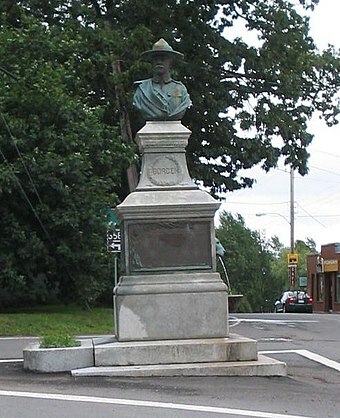 Turner would later become a high-ranking officer in the Canadian army in World War I.
Canadians ended the war with four Victoria Crosses to its soldiers and two more Victoria Crosses were given to Canadian doctors attached to British Medical Corps units, Lieutenant H.E.M. Douglas (1899, Magersfontein) and Lieutenant W.H.S. Nickerson (1900, Wakkerstroom). 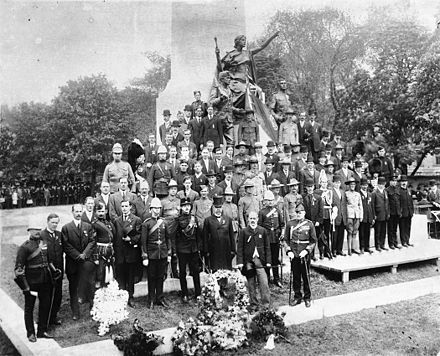 Not all soldiers saw action since many landed in South Africa after the hostilities ended while others (including the 3rd Special Service Battalion, The Royal Canadian Regiment) performed garrison duty in Halifax, Nova Scotia so that their British counterparts could join at the front lines. Later on, contingents of Canadians served with the paramilitary South Africa Constabulary. Both sides used a scorched Earth policy to deprive the marching enemy of food. And both had to corrall civilians into makeshift huts by 'concentrating them camps. For example, at Buffelspoort British soldiers were held in captivity in Boer encampments after surrendering their arms, and civilians were often mixed in with service personnel because the Boer did not have the resources to do otherwise. A total of 116,000 women, children and Boer soldiers were confined to the Commonwealth concentration camps, of which at least 28,000, mainly women and children, would die. The lack of food, water, and sanitary provisions was a feature of 20th century warfare for both civilians and armed services personnel, yet one consequence of the Boer War and investigative commissions was the implementation of The Hague Convention (1899) and Geneva Convention (1904); of which there were many further agreements thereafter. ↑ Larger numbers of volunteers came from the Netherlands, Germany and Sweden-Norway. Smaller forces came from Ireland, Australia, Italy, Congress Poland, France, Belgium, the Russian Empire, the United States, Denmark and Austria-Hungary. Stephanus Johannes Paulus "Paul" Kruger was one of the dominant political and military figures in 19th-century South Africa, and President of the South African Republic from 1883 to 1900. Nicknamed Oom Paul, he came to international prominence as the face of the Boer cause—that of the Transvaal and its neighbour the Orange Free State—against Britain during the Second Boer War of 1899–1902. He has been called a personification of Afrikanerdom, and remains a controversial and divisive figure; admirers venerate him as a tragic folk hero, and critics view him as the obstinate guardian of an unjust cause. Uitlander, Afrikaans for "foreigner", was a foreign migrant worker during the Witwatersrand Gold Rush in the independent Transvaal Republic following the discovery of gold in 1886. The limited rights granted this group in the independent Boer Republics was one of the contributing factors behind the Second Boer War. Petrus Jacobus Joubert, better known as Piet Joubert, was Commandant-General of the South African Republic from 1880 to 1900. Alfred Milner, 1st Viscount Milner, was a British statesman and colonial administrator who played an influential leadership role in the formulation of foreign and domestic policy between the mid-1890s and early 1920s. From December 1916 to November 1918, he was one of the most important members of David Lloyd George's War Cabinet. Field Marshal Jan Christian Smuts, OM, CH, ED, KC, FRS was a prominent South African and Commonwealth statesman, military leader, and philosopher. He served as a Boer General during the Boer War, a British General during the First World War and was appointed Field Marshal by King George VI during the Second World War. In addition to various cabinet appointments, he served as Prime Minister of the Union of South Africa from 1919 until 1924 and from 1939 until 1948. From 1917 to 1919 he was one of five members of the British War Cabinet, helping to create the Royal Air Force. He played a leading part in the post-war settlements at the end of both world wars, making significant contributions towards the creation of the League of Nations and the United Nations. He did much to redefine the relationship between Britain and the Dominions and Colonies, leading to the formation of the British Commonwealth. Jan Christiaan Smuts, OM was a prominent South African and Commonwealth statesman and military leader. He served as a Boer General during the Boer War, a British General during the First World War and was appointed Field Marshal during the Second World War. In addition to various Cabinet appointments, he served as Prime Minister of the Union of South Africa from 1919 to 1924 and from 1939 to 1948. He played a leading part in the post war settlements at the end of both world wars, making significant contributions towards the creation of both the League of Nations and the United Nations. The Battle of Magersfontein was fought on 11 December 1899, at Magersfontein near Kimberley, South Africa, on the borders of the Cape Colony and the independent republic of the Orange Free State. British forces under Lieutenant General Lord Methuen were advancing north along the railway line from the Cape in order to relieve the Siege of Kimberley, but their path was blocked at Magersfontein by a Boer force that was entrenched in the surrounding hills. The British had already fought a series of battles with the Boers, most recently at Modder River, where the advance was temporarily halted. The Queen's South Africa Medal is a British campaign medal awarded to British and Colonial military personnel, and to civilians employed in an official capacity, who served in the Second Boer War in South Africa. Altogether twenty-six clasps were awarded, to indicate participation in particular actions and campaigns. 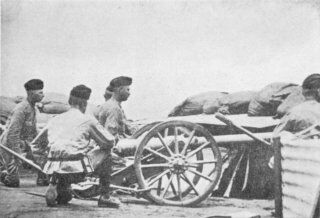 The Siege of Kimberley took place during the Second Boer War at Kimberley, Cape Colony, when Boer forces from the Orange Free State and the Transvaal besieged the diamond mining town. The Boers moved quickly to try to capture the British enclave when war broke out between the British and the two Boer republics in October 1899. The town was ill-prepared, but the defenders organised an energetic and effective improvised defence that was able to prevent it from being taken. 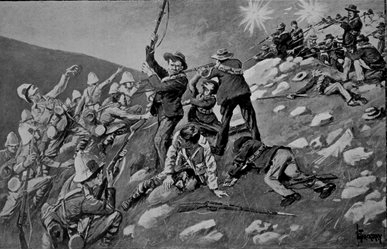 The Drifts Crisis of 1895 was an imperial-republican confrontation in South Africa that took place in September and October 1895. It was precipitated by the closing of fords, which in South Africa were known as ‘drifts’, hence the name. The Crisis has traditionally been seen as the precursor to the Jameson Raid and the uncompromising policies of High Commissioner for Southern Africa Alfred Milner which followed, and eventually led to the Second Anglo-Boer War. Historians generally regard the conflicts to have been between the Cape Colony and the South African Republic (SAR), informally known as the Transvaal Republic. 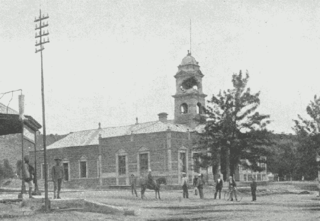 The Battle of Ladysmith was one of the early engagements of the Second Boer War. A large British force which had concentrated at the garrison town of Ladysmith launched a sortie on 30 October 1899, against Boer armies which were slowly surrounding the town. The result was a disaster for the British. The main body was driven back into the town, and an isolated detachment of 800 men was forced to surrender to Commandant De Wet. The Boers did not follow up their advantage by proceeding towards the strategically important port of Durban, and instead began a Siege of Ladysmith, which was relieved after 118 days. The military history of Australia during the Boer War is complex, and includes a period of history in which the six formerly autonomous British Australian colonies federated to become the Commonwealth of Australia. At the outbreak of the Second Boer War, each of these separate colonies maintained their own, independent military forces, but by the cessation of hostilities, these six armies had come under a centralised command to form the Australian Army. In the South African Boer republics of the 19th century, a burgher was a fully enfranchised citizen. ↑ Grattan 2009, pp. 147–58. ↑ Haydon 1964, p. [ page needed ]. ↑ Keppel-Jones 1983, pp. 590–59. 1 2 sahoboss (31 March 2011). "Role of Black people in the South African War". ↑ Scholtz, Leopold (2005). Why the Boers Lost the War. Basingstoke: Palgrave-Macmillan. pp. 2–5, 119. ISBN 978-1-4039-4880-9. ↑ Wessels 2011, p. 79. ↑ Millard, Candice (2016). Hero of the Empire: The Boer War, a daring escape, and the making of Winston Churchill. New York: Doubleday. ISBN 9780385535731 . Retrieved 14 April 2017. ↑ Biggins, David. "Khaki Election of 1900". angloboerwar.com. Retrieved November 27, 2018. 1 2 "Women & Children in White Concentration Camps during the Anglo-Boer War, 1900-1902". South African History Online. 2011-03-21. Retrieved 2019-02-20. ↑ South African History Online 2011. ↑ Pakenham 1979, p. xxi. ↑ Keegan, Timothy. Colonial South Africa and the Origins of the Racial Order (1996 ed.). David Philip Publishers (Pty) Ltd. pp. 15–37. ISBN 978-0813917351. 1 2 Greaves, Adrian. The Tribe that Washed its Spears: The Zulus at War (2013 ed.). Barnsley: Pen & Sword Military. pp. 36–55. ISBN 978-1629145136. 1 2 Morris & Linnegar 2004, pp. 58–95. ↑ Colenbrander, Herman. De Afkomst Der Boeren (1902). Kessinger Publishing 2010. ISBN 978-1167481994. ↑ Giliomee, Hermann (1991). The Creation of Tribalism in Southern Africa. Berkeley: University of California Press. pp. 21–28. ISBN 978-0520074200. 1 2 Pakenham 1979, pp. 1–5. ↑ Pakenham 1979, pp. 493–95. ↑ Cartwright 1964, p. [ page needed ]. ↑ Yap & Leong Man 1996, p. 134. ↑ Nathan 1941, p. [ page needed ]. ↑ Bester 1994 , p. [ page needed ]; Wessels 2000 , p. 80. ↑ Connolly, C.N. Manufacturing Spontaneity. ↑ Surridge 2000, p. 24. ↑ Dunlop, Colonel John K., The Development of the British Army 1899–1914, London, Methuen (1938) p 72. ↑ Searle 2004, p. 276. ↑ Wessels 2000, p. 74. ↑ Pretorius 2000, p. 179. ↑ Pakenham 1991a, p. 573. ↑ Craig Wilcox, Australia's Boer War, pp. 84–85. 1 2 "Anglo-Boer War Philatelic Society: Collecting Interests". Archived from the original on 10 December 2005. ↑ Limited, Burgh House Software for Moonbeams. "Saint Helena Island Info: All about St Helena, in the South Atlantic Ocean • Boer Prisoners (1900–1902)". ↑ Cameron 1986, p. 207. ↑ Blake 2010, p. 46. ↑ Pakenham 1991, p. 571. ↑ Blake 2010, p. 140. ↑ Marsh 1994, pp. 483–85. ↑ Davidson & Filatova 1998, p. 80. ↑ Warwick 1983, p. [ page needed ]. ↑ Pretorius 2011, p. [ page needed ]. ↑ Hasian Marouf, Western journal of communication, 2003. ↑ "Black Concentration Camps during the Anglo-Boer War 2, 1900-1902". South African History Online. 2011-03-21. Retrieved 2019-02-20. ↑ Pakenham 1979, p. 493. ↑ Wessels 2010, p. 32. ↑ O'Brien 1988, p. [ page needed ]. ↑ Grundlingh 1980, pp. 258–78. ↑ Onselen 1982, p. [ page needed ]. ↑ Onselen 2003, pp. 483–526. ↑ Swardt 1998, p. 97. ↑ McElwee 1974, pp. 223–29. ↑ Hayes 1902, pp. 213–14. ↑ Davis 1900, p. 34. ↑ Jacson 1908, p. 88. ↑ Pocock 1917, p. viii fn. 11. 1 2 3 4 5 6 Webb 2010, pp. 75–90. 1 2 Granatstein 2010, p. [ page needed ]. ↑ Berger 1970, pp. 233–234. 1 2 3 Wessels 2009. 1 2 3 4 5 6 Pulsifer 2017. 1 2 Pugsley, Christopher (2016). 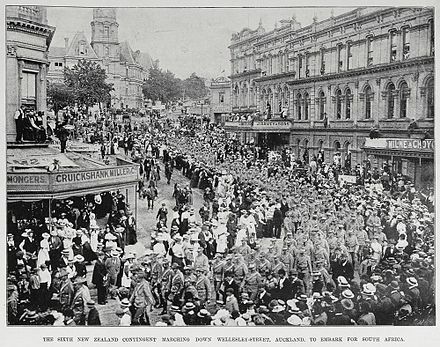 The ANZAC Experience: New Zealand, Australia and Empire in the First World War. Auckland, New Zealand: Oratia. pp. 42–43. ↑ Phillips, Jock (1990). 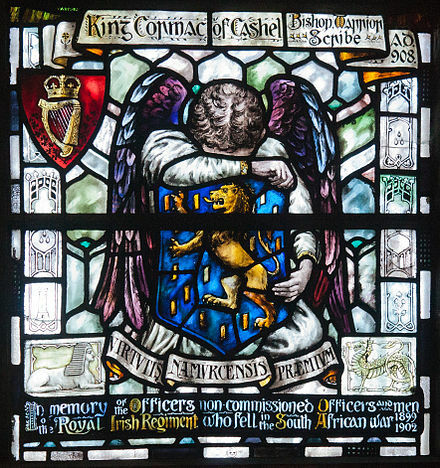 The Sorrow and the Pride: New Zealand War Memorials. Wellington, New Zealand: GP Books. p. 48. 1 2 "Borden, Harold Lothrop". Dictionary of Canadian Biography, Volume XII (1891–1900). ↑ Witton 2003, p. [ page needed ]. ↑ Pakenham 1991a, p. 568. ↑ Powell 2015, p. [ page needed ]. ↑ Desai & Vahed 2015, p. [ page needed ]. 1 2 "Victoria Cross" (PDF). Government of Canada. Archived from the original (PDF) on 4 March 2016. Retrieved 6 December 2018. ↑ "History of Royal Canadian Dragoons". Archived from the original on 22 November 2012. ↑ Berger 1970, pp. 233–34. ↑ Gous, Nico. "Boer War women, children put in concentration camps 'for own good': British MP sparks outrage". Grundlingh, Albert (1980). "Collaborators in Boer Society". In Warwick, P. The South African War. London. pp. 258–78. Pretorius, Fransjohan (2000). "The Experience of the Bitter-Ender Boer". In Gooch, John. The Boer War: Direction, Experience and Image. London: Cass. p. 179. Pretorius, Fransjohan (2011). "Anglo-Boer war". In Jacobs, S.; Johnson, K. Encyclopedia of South Africa. Surridge, Keith (2000). "Lansdowne at the War Office". In Gooch, John. The Boer War: Direction, Experience and Image. London: Cass. p. 24. Villiers, J.C. de (June 1984). "The Medical Aspect of the Anglo-Boer War, 1899–1902 Part ll". Military History Journal. 6 (3): &#91, page&nbsp, needed &#93, . Wessels, André (2000). "Afrikaners at War". In Gooch, John. The Boer War: Direction, Experience and Image. London: Cass. Wikimedia Commons has media related to Second Boer War . 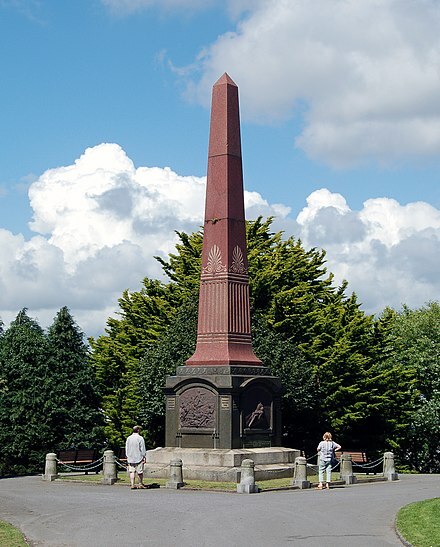 Wikimedia Commons has media related to Memorials of the Boer wars .